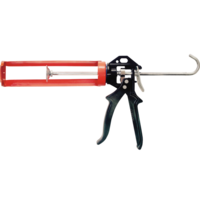 Our caulking guns make your installation or sealing jobs easier. They are designed so that you do not lose precision, whatever the angle of application. Caulking guns made for you that last a lifetime. Steel body for better resistance and durability. Friction-propelled gun, so that you can be more exact when applying and use just the right amount. Multiplier effect to maximise strength during application.